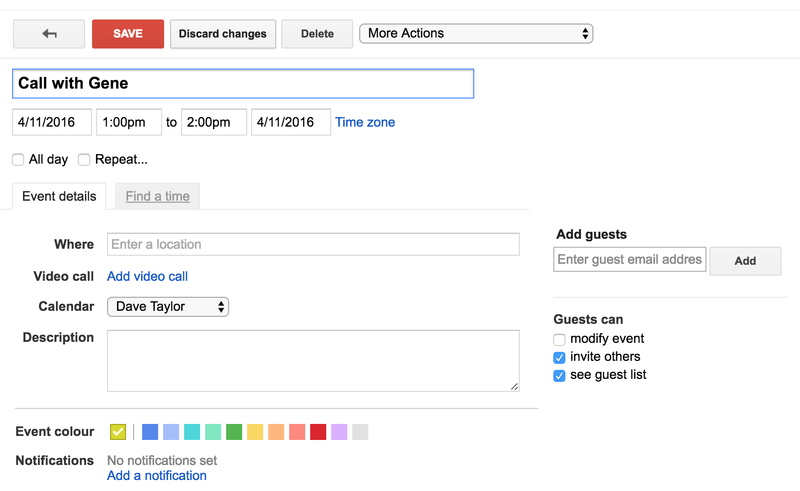 / Invite someone to a meeting in Google Calendar? Ah yes, the great calendar war, where we get to pick a side, either Google Calendar, probably because we’re running Microsoft Windows and have an Android phone, or Apple Calendar, to go with our Mac system and Apple iPhone. Rather amazingly, the two don’t really play very well together at all and while different solutions have come and gone over the years, none seems to actually offer reliable and trustworthy sharing in both directions. As a result, your suggestion about duplicating events so that they’re in your iCal calendar as well as Google Calendar (I don’t think anyone calls it gCal any more) is probably the path of least hassles, dorky and 90’s though it may be. But that leaves you needing to know how to quickly and easily set up an event and send out an invitation to your client so they think you’re just “on board” with their preferences! Click on “Add” and you have a new event. Easy. Done. You still have to invite the other person to your meeting. To do that, either click on the event description in the creation confirmation message (as below) or find the event on your calendar view and click on it. As is immediately obvious when you start using Google Calendar, they haven’t spent much effort on design or user interface. It’s all very bare-bones. In this case, however, that means there are less distractions. To get to the detailed view and lots of different options, simply click on “Edit event“. Now you’ll see there are lots of choices! Since it’s just the two of us, his presence is not optional. You can choose that if you want for your event, but if it’s just you and your client, that’s probably not going to be useful! And that’s all there is to it. Just don’t forget to copy it onto your Apple Calendar too!